Investors are becoming increasingly nervous about the outlook for returns. Volatility and uncertainty are back – resilient businesses models should be best placed to weather the challenges that lie ahead. Structural growth is likely to underpin the sustainability of returns. Prudent stock selection will be required to separate the winners from the losers in 2019. After the optimism and strong returns of 2017, volatility has stalked equity markets in 2018 as risks emerge. While the US economy appears to be strong, talk of synchronised global growth has waned and the investment outlook for 2019 is less certain. As the US Federal Reserve began to steadily hike rates on a path towards monetary policy ‘normalisation’, the market has started to digest the impact of higher yields and withdrawing liquidity on asset prices. For companies trading on high multiples with hefty growth assumptions, the market can be unforgiving in the face of tightening monetary conditions and higher yields. Indeed, US dollar strength and tightening monetary conditions have already impacted emerging markets, where we have seen volatility, in particular in the Argentine peso and Turkish lira. Further risks remain in more fragile emerging markets, where tighter dollar funding conditions are likely to prove challenging for weaker borrowers. Beyond liquidity withdrawal, investors face a long list of macroeconomic risks. Commodity price volatility, technological disruption, changing demographic trends, escalating trade wars and tariffs, and global debt levels can create challenges for markets. Going into 2019 against this uncertain backdrop, we believe focusing on structural, rather than cyclical, growth will be key. The fortunes of external factors, such as commodity prices, interest rates, or the economy, cannot be relied upon to sustain growth. developing trends in healthcare, longevity and beauty. Meanwhile, we are aware of the potential threats that exist to the dominant market positions of certain quality companies. For example, we pay close attention to disruption in the consumer staples sector. While the impact of the ‘infinite shelf’, made available by e-commerce, is lowering barriers to entry and supporting smaller brands and private label penetration, this impact is not felt equally across all categories. Therefore, the impact will not be felt evenly across companies. In many cases it will likely provide opportunities as well as risks, requiring careful stock selection. Quality companies can reinvest cashflows for future growth. In sectors such as IT, healthcare and consumer discretionary are capital-light, cash-generative businesses that typically spend the most on research and development (R&D). This investment in R&D allows companies to innovate, which in turn entrenches competitive positioning and ensures the sustainability of growing cashflows. In aggregate, Global Franchise companies vastly outspend the market as a whole, investing nearly four times more – as a percentage of sales – on R&D. Source: FactSet, based on constituents of MSCI ACWI, as at 31.08.18. Despite this heavy investment, these companies still generate far superior margins and returns on capital than the broader market. Source: FactSet, Investec Asset Management, as at 30.09.18. Considering the macroeconomic and geopolitical risks, and the uncertain investment outlook we have highlighted, it is now more important than ever to invest in companies which are not dependent on cyclical drivers or economic conditions. We believe that carefully selected quality companies, with long-term structural, rather than shortterm cyclical growth drivers, should be well placed to perform in 2019. We will continue to focus on finding these attractively valued quality companies, with demonstrably enduring competitive advantages that are able to grow their cashflows into 2019 and beyond. Several idiosyncratic factors weighed on European markets in 2018, despite rising earnings, improving balance sheets and signs of growing M&A activity. After a difficult 2018, we are cautiously constructive going into 2019. The investable universe in Europe continues to evolve, generating new opportunities. 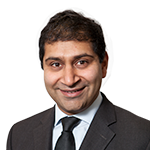 We believe the risks to our base case are well known and look for exposure where risk and reward is skewed favourably. Perhaps with trepidation we welcome 2019. After the bloodied nose received through 2018, we are perhaps allowed to show more caution than a year ago. 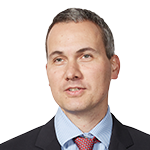 While we remain constructive on European equities, we look to reflect on the past year to give clues to what the new year may bring. Source: Bloomberg, 31.10.18. For further information on indices, please see the Important Information section. From a corporate viewpoint, 2018 went as planned: earnings rose as expected, balance sheets continued to strengthen and signs of M&A activity increased. However, European markets drew down. So, what happened? Is the market signaling imminent danger, or are investors being given a chance to buy at better prices? Falling prices simply mean a transfer of value from sellers to buyers especially at a time when balance sheets are strengthening. Actions to narrow the trade deficit between the two largest economies in the world, the US and China. Brexit uncertainty and seemingly chaotic negotiations. The new Italian government’s spending plans. In the US, politics is a key driver, including (still two years out) the US presidential election in 2020, and the Republican’s loss of the House of Representatives, causing political gridlock in the meantime. Much has been written on each of these subjects, but our central case currently is that of positive but slower growth. Going into 2019 we continue to focus on strong structural themes that are global in nature. We are often asked how truly technologically advanced Europe is given it does not have the global technology giants the other markets have. Indeed, this may be a time to reflect on how corporates are adapting the worlds we live in: how the European universe of stocks is changing to meet new challenges and more importantly to reward investors for their patience. On technology, one only must step onto the high street to observe not just the emerging cashless society, but also contactless technology adoption meaning a device on your wrist is all you need to pay your way through the day. Indeed, the fast-growing payment solutions sector is firmly anchored in Europe through the likes of Adyen and Wirecard, which are leading the way into further innovative ways to pay for everyday necessities. In the financials sector we are witnessing the maturation of fintech onto the stock market. With no legacy infrastructure nor balance sheets, these companies can grow strongly, cherry-picking profitable niche areas such as small-to-medium enterprise lending. This is an underserved market by incumbents, because the opportunity is too small for the c. €1 trillion size of their balance sheets. Europe, specifically the Czech Republic, is home to the largest consumer security software company, Avast, with over 435m users. Its ‘freemium’ model cannot easily be replicated by competition. With less than 5% of the users paying, it earns decent margins to fund innovation into new products as well as drive ‘premiumisation’, giving good growth visibility. We still like the energy sector, though we acknowledge greater oil price volatility at current higher prices. The world is decarbonising, but our role is to engage not avoid, enabling the targets set by the Paris Agreement to be met. The strong cashflows generated by oil and gas need to be reallocated better. We also understand natural gas has a place in a low-carbon environment and will remain so until large scale energy storage is achieved. We still have exposure to financials, whether through banks or insurance, where these mature sectors rely on economic recovery for growth as market share gains can only be small. For banks, we are seeing returns rise and note improving revenue performance as the economic recovery unfolds. We also note that many banks are back to 2012 lows despite better financial performance. The sector has not had a proper stock market recovery. Changing regulation is driving insurers away from capital-heavy products, annuities and guaranteed return products towards capital-light stock market-driven products. The transfer of risk to the end client, while reducing system risk, is driving more direct exposure to equity and fixed income products. Insurance companies in turn are freeing up much excess capital to be returned to shareholders as well as focus on other capital light strategies such as digital. In short, we are seeing the evolution of the investable universe in Europe through competition, regulation or stewardship by investors. Longer-term capital owners should take comfort. We acknowledge that the risks to economic growth have heightened, with outstanding questions remaining. When will the US and China de-escalate on trade issues? Will the UK leave the EU with no trade deal? How will Italy’s new government deal with opposition to its spending plans? However, cyclical stocks have generally sold off indiscriminately through 2018, despite structural growth drivers and/or adapted business models that reduce cyclicality in some. Along with strong balance sheets, opportunities have presented themselves. Regarding the risks, we remain pragmatic, looking to avoid stocks where we are not being paid to take the risk, especially with cyclicals where margins have peaked. We have also worked hard to assess further downside. For example, in the event of a no-deal Brexit, we have avoided industrial stocks which depend on the frictionless movement of components. We also note that on agricultural and food products, port have already been identified as key risks, where customs arrangements need to be established to allow unencumbered movement of goods, similar to how it is in Switzerland. What may be reasonable to expect is continued volatility as politicians tend to engage in brinksmanship. We remain constructive on European equities. We expect slow but positive growth globally, meaning some cyclical sectors have become attractive, having sold off indiscriminately. We also see opportunities in European multinationals with structural growth drivers offering diversification benefits. We believe the risks to our base case are well known and look for exposure where risk and reward is skewed favourably. Investors are becoming increasingly nervous about the outlook for returns and dividends. Volatility and uncertainty have returned to markets – sustainable business models will be best placed to weather the challenges that lie ahead. 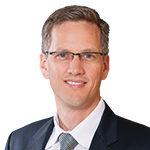 Structural growth will underpin the sustainability of cashflows and dividends. Prudent stock selection will be required to separate the good from the unsustainable in terms of income. 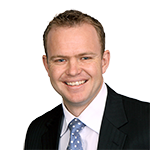 After the strong returns of 2017, this year has seen volatility return to equity markets as several risks emerged. While the US economy appears to be strong, talk of synchronised global growth has waned and the investment outlook less certain. As the US Federal Reserve continues to hike rates on a path towards monetary policy ‘normalisation’, the market will begin to digest the impact of higher yields and withdrawing liquidity on asset prices. 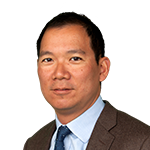 For companies trading on high multiples with hefty growth assumptions, the market can be unforgiving in the face of tightening monetary conditions and higher yields. Indeed, US dollar strength and tightening monetary conditions have already impacted emerging markets, where we have seen volatility in particular in the Argentine peso and Turkish lira. Further risks remain in more fragile emerging markets where tighter dollar funding conditions are likely to prove challenging for weaker borrowers. Beyond liquidity withdrawal, investors face a long list of macro risks. Commodity price volatility, technological disruption, changing demographic trends, escalating trade wars and tariffs, and global debt levels can create challenges for markets. Going into 2019 against this uncertain backdrop, we believe it will be important for equity income investors to focus on companies that largely control their dividend-paying ability. Investors cannot rely solely on the fortunes of external factors, such as commodity prices, interest rates, or the economy, to sustain dividend growth. We have already seen significant volatility in dividends in recent years in more capital-intensive areas of the market. These ‘price-taking’ businesses have funded unsustainable pay-outs through the balance sheet using debt and disposals, rather than cashflows. As Quality investors, we focus on capital-light, cash-generative businesses that are typically underpinned by structural growth. These companies can sustainably return a proportion of their growing cashflows to investors as dividends and re-invest the remainder for future dividend growth. Most of these businesses have continued to grow their dividends. Source: FactSet, December 2017. Dividends calculated as total dividends paid in USD, for all companies within the MSCI AC World Index, aggregated by GICS sector. Capital light sectors defined as Information technology, Healthcare, Consumer discretionary, Consumer staples. Capital intensive sectors defined as Materials, Industrials, Energy, Telecommunication services, Real estate, Utilities. For further information on indices, please see the Important Information section. CAGR = Compound Annual Growth Rate. We believe that carefully selected quality income companies, with long-term structural, rather than short-term cyclical growth drivers, should be well placed to perform in 2019. We will continue to focus on finding these attractively valued quality income companies, with demonstrably enduring competitive advantages that are able to grow their cashflows and dividends into 2019 and beyond. 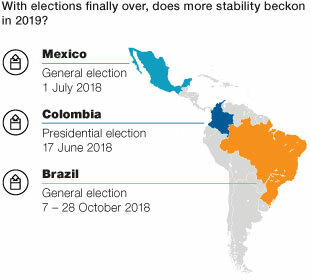 Elections in Mexico, Colombia and Brazil are finally over, providing more certainty on policy direction, with results better than some feared. Markets are now free to focus on fundamentals, such as the high level of corporate financial health for the region as a whole. The global environment remains challenging, especially the trade wars. Earnings and balance sheets remain robust and supportive. We are carefully monitoring political, economic and corporate risks, but remain broadly optimistic for the future of Latin American equities in 2019. The intense electoral calendar has taken a toll on investor sentiment. Uncertainty, doubts on sustainability, volatility, and fear of a populist comeback have all weighed on Latin American equities. This will not be the case for 2019. 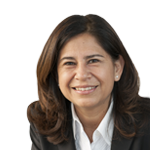 The elections in Colombia, Mexico and Brazil should deliver more certainty regarding policy direction. Outcomes look much better than the worst scenarios that investors were pricing in in 2018. Both elections in Mexico and Brazil delivered a clear vote in favour of anti-establishment candidates at the expense of traditional parties. In Mexico, the main losers are the traditional parties of Partido Revolucionario Institucional (PRI) and Partido Acción Nacional (PAN) which had previously been in power. Likewise in Brazil, the traditional parties were all soundly defeated including the Workers’ Party, Partido dos Trabalhadores, (PT), the Partido do Movimento Democrático Brasileiro (PMDB) and Partido da Social Democracia Brasileir (PSDB). In both countries, the new administrations imply governability risks, but we do not foresee space for institutional risk. Regarding the expected increase in US Federal Reserve rates, both Mexico and Brazil look quite well positioned as current accounts are financed by foreign direct investments. We are optimistic that we might have left the bottom behind regarding the domestic investment cycles. The global environment remains challenging, although we would highlight that Mexico has benefitted from the new trade agreement: The United States-Mexico-Canada Agreement (USMCA), which will replace Nafta. Meanwhile, Brazil has been a US/China tariff war winner. The result has not been that bad despite the risk aversion fears emerging markets faced in general. Elsewhere, the Andean countries are marching back toward potential growth, with inflation safely within target ranges. With the elections out of the way, we might finally see the market focusing on Latin American corporate health. Earnings upside potential is still compelling, with consensus growth expectations of +36% in US dollar terms for 2018, higher than estimates for global emerging markets as a whole (+13%). For 2019, earnings are expected to grow another 15% in dollar terms. In addition, momentum on earnings estimates seems to have begun improving, with a 3.3% increase in September, pushed mainly by upward revisions in Brazil, which we believe should rise even further over the next few months. Source: Bloomberg and Santander estimates, 31.08.18. In terms of valuations, Latin American equities look attractive versus other regions, for small, mid, and large caps. Also, Latin American equities are trading at a smaller premium versus its own historic average compared to any other region versus their historic averages. We are expecting earnings-per-share growth compound annual growth rate (CAGR) 2017-19 for Latin American small caps of 30%. Return on equity continues to rise at 11.0%, and is still below the historic average of 13.6%. Source: MSCI, 31.10.18. For further information on indices, please see the Important Information section. Prudent capital structures, avoiding excessive levels of indebtedness and currency mismatches between revenues and debt, while extending maturities. 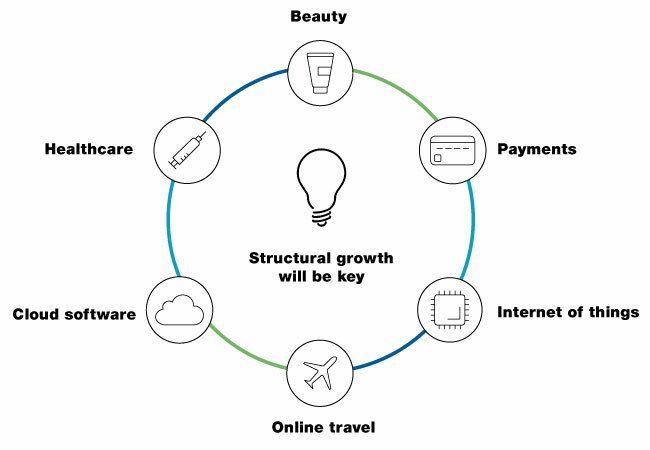 Secular dynamics with higher growth related to new trends in consumption such as e-commerce. Leaders in fragmented market niches which are consolidating. Winners of the process of formalisation of economies. We see opportunities in companies levered to domestic growth and secular themes. An emerging and growing middle class, expanding services, infrastructure potential, and new technology support multi-year secular changes in habits that are here to stay. We continue to look for the large caps of tomorrow. Politics: The new administrations will be tested. They need to demonstrate they have enough political ability to address the main social needs and promote sustainable growth. Economy: Macro-friendly policies need to be in place and reassure businesses, so as to liberate potential growth. Reforms are needed to regain productivity. 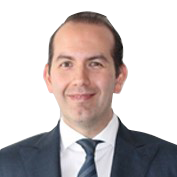 Corporate: Latin American corporates need to keep on focusing on finding multi-year efficiencies and delivering increasing profitability. We are optimistic for the medium term in Latin America. If core market-friendly policies are put in place and productivity is unlocked, chances are high that the region’s economic growth will approach its potential and might be close to navigating calmer waters, with more visibility. Latin American corporates are in good shape to capture this new stage. The road ahead might be bumpy, but we are moving in the right direction. 1 The rate that a company is expected to pay on average to all its security holders to finance its assets. 2018 has brought extreme volatility in the mirror opposite of 2017, officially entering bear market territory as of time of writing. There have been 19 market corrections since 2003, four of which have been more than 20%. Of those four, only once has the market not been higher than the previous trough 12 months later. Recovery will require a catalyst, such as a thaw in earnings or domestic stimulus. The good news is that corporate balance sheets remain solid. In this scenario we find it far more convincing to make investment decisions based on bottom-up fundamentals. Was Baron Rothchild correct when he said, “The time to buy is when blood is on the streets”? 2018 has produced all the volatility that 2017 lacked. So, what has changed and how is that likely to affect the investment opportunities looking into 2019? As of time of writing, Asian markets have officially entered bear market territory, having fallen more than 20% since the early 2018 highs. Earnings have been downgraded, as have valuations, which have slumped to levels last seen in previous troughs. However, expectations for earnings growth remain positive. There have been 19 market corrections in Asia since 2003 and only four of these have been more than 20% declines. Among these, the average price/earnings ratio (P/E) at the trough has been 10.4x forward P/E vs. the recent trough valuation of 10.6x forward P/E. Equally, on a price-to-book (P/B) basis, previous troughs have averaged 1.6x P/B vs. the recent valuation of 1.4x P/B. Only once before has the price-to-book ratio fallen below the level seen recently. Following these troughs in valuation, there have only been three instances where the index was lower a year later, the most severe of which was during the global financial crisis. Despite the pessimism experienced at each of these troughs, on average the index was over 20% higher in the subsequent twelve months. In terms of well-understood behavioural biases in markets, we are now at the point of fear, with investor sentiment having turned negative and flows out of the region reaching the levels of capitulation last seen in the 2015-16 market correction. What’s the catalyst for recovery? Are we at a point where you can see potential for 20% returns? Or are we in one of the few instances where the market ended up lower twelve months from now? The 4Factor investment team has long believed that neither high returns nor low valuations on their own make an investment case. We need a catalyst to drive an improvement in investor sentiment, or higher earnings upgrades. In the near term, China’s slowdown, US dollar strength, higher interest rates and trade concerns are likely to weigh on investor sentiment, while delayed spending decisions from both companies and consumers are leading to earnings downgrades. Despite limited spending, recent industrial trade fair surveys in China suggest the desire to invest remains strong. Therefore, an improvement in sentiment – either through a thawing of trade concerns or some sort of domestic stimulus – would send the markets higher as investors sitting on the sidelines start to invest. Figure 1: Where do earnings go from here? Forecasts are inherently limited and are not a reliable indicator of future results. Source: Factset, Investec Asset Management, 05.09.18. How should one position portfolios in this scenario? Some of these positions are counterintuitive and contrary to market behaviour in the past ten years. Earnings are no longer growing across the board, which means that building a more balanced portfolio looks reasonable. Equally, with interest rates rising in the US, discount rates for all assets have risen, which in turn has led to a correction in long-term value assumptions, particularly for growth stocks. Likewise, high-dividend stocks have been defensive over the last ten years as investors have reached for yield. However, rising interest rates may start to undermine their defensive credentials. Add into this that quality remains expensive and you have a more confused picture than at perhaps anytime in the previous decade. We also have conflicting signals from both sides of the world. The US Federal Reserve continues to tighten as business conditions remain robust and policy is deregulating. In China, policy and financial liquidity remain tight, as the country tries to address its high debt levels, which is causing a slowdown in demand. These are two very different paths. When deciding which stocks are likely to perform, investors will need to decide which will have the bigger effect. The good news for Asia is that unlike the previous bear market in 2015-16, corporate balance sheets are healthier, free cashflow has been strong, and margins have been improving. This allows more flexibility to absorb any weakness in demand. Ultimately, the outcome of whether or not markets will be significantly higher in twelve months’ time depends on whether the conflicting economic signals trigger some sort of recessionary scenario. Longer term, the potential for Asia remains strong. We are still seeing increased investment into research and development, and domestic demand continues to increase as a percentage of GDP. Equally, Asia remains committed to policy reform to address high debt levels and curb excess supply. Despite near-term concerns, these longer-term trends should provide greater stability and higher quality growth. In this environment, we find it far more convincing to make investment decisions based on bottom-up fundamentals. We continue to believe that it is best to look for high-quality, attractively valued stocks, with improving operating performance and increasing investor attention. After a decade of easy money, central banks now need to shrink their balance sheets and raise rates to prepare for the next downturn. 2019 is likely to be the ‘moment of truth’ when we will see which asset classes have become the most distorted. Geographically, we see opportunities in emerging markets, Europe and Japan. On a sector basis, we see value in financials and industrials, while there are early signs of opportunity in healthcare and consumer staples. Selection based on sound balance sheets will be increasingly important in 2019. It is no secret that the low interest rate environment of the last decade created a scarcity of investment returns. By suppressing the yield on the safest asset classes, central banks all over the world engineered a situation where investors were forced to ‘reach for yield’ in ever-riskier products. Slowly, but surely, this yield suppression is coming to an end and in fact reversing. Central banks need to shrink their balance sheets, not only because permanently stimulating monetary policy can have unintended consequences, but also because they need to rebuild their ammunition for when the next recession hits. No central bank wants to enter a recession with interest rates at zero and a constrained balance sheet. Over the course of 2019 we will be able to see where this money has been flowing and which asset prices have become most distorted. To some degree we are already seeing the first symptoms of this withdrawal of easy money, most notably in the rise of bond yields worldwide and in the weakening of emerging market currencies and equity markets. The equity market swings in October 2018 could also be ascribed to this phenomenon. We are also likely to see dispersion increase within markets, as those companies that have financed themselves imprudently, or whose valuations have been pushed to unrealistic heights, see their stock prices decline. The US looks particularly vulnerable to this, as Figure 1 illustrates. 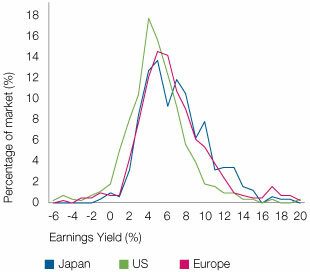 The left-hand chart shows the historical distribution of valuations in the US, European and Japanese equity markets, while the right-hand-chart shows today’s distribution. 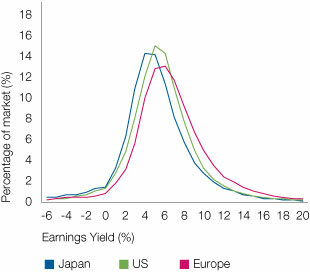 It appears that while European and Japanese equity markets are no more expensive than average, the US is on a lower earnings yield compared to its history and other markets. Source: Société Generale Cross Asset Research, Equity Quant, 8.10.18. Where are the ‘value’ opportunities? Our current opportunity set is in line with this assessment. We see many more opportunities in emerging markets, Europe (including the UK) and Japan than we do in the US. 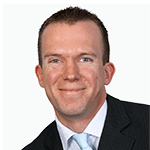 UK and emerging market equities appear particularly attractive, owing to their recent weakness. On a sector level, we continue to find value in financials, which should do well if interest rates continue to rise, as well as in industrial companies which we see as trading below their long-term intrinsic value. After having little-to-no exposure to healthcare and consumer staples for some time, we are finding several such companies trading at apparently attractive valuations. 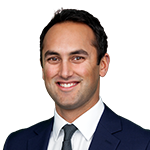 Both of those sectors, however, still contain many companies whose perception as ‘safe’ or as ‘bond proxies’ could prove to be flawed. Finally, we think balance sheets are likely to prove particularly important going forward. We intend to be particularly cautious around businesses that have financed themselves inappropriately during the easy times. 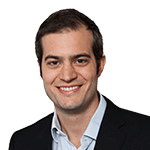 Alessandro Dicorrado: Is this the moment of truth? 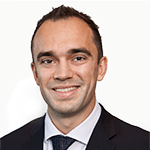 As part of The Big Picture Podcast channel, Alessandro Dicorrado sees 2019 as being the moment of truth where we will see which asset classes have been the most distorted over the last decade.